Several months ago, various posters on internet discussion boards starting putting a curious tag-line in their signatures. “Change is coming, BIG, SPIRITED change!” As the months have gone on, more details have come out regarding what kind of big change could be coming within the Walt Disney Company and the potential positive results it could bring to Walt Disney World. Continue after the break to find out why Iger might be on his away out sooner than anticipated and why the trickle down effect it creates for the Walt Disney World Resort could be a very good thing! Details are understandably scarce and sometimes vague, but I’ve been able to gather various pieces of information and fit them together. First, it should be noted that Bob Iger, CEO and Chairman of the board of The Walt Disney Company, has already announced his intent to retire and move on to the next phase of his life, presumably as a politician (no, really, that’s what I’m hearing). By March 31st, 2015 an announcement of his successor will take place and the new CEO will take the reigns of the company. So how could that timeline be accelerated? 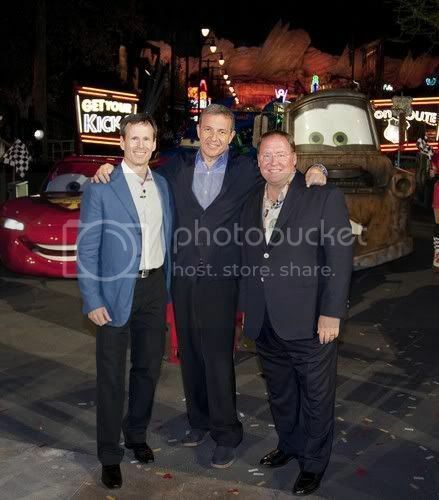 As discussed on the rumor segment of the DIS Unplugged, apparently Iger, affectionately referred to as “the weather man” by many in the fan community, has been in a feud with John Lasseter. John Lasseter is the Chief Creative Officer at Pixar and Walt Disney Animation Studios as well as the Principal Creative Advisor for Walt Disney Imagineering. Lasseter was upset at the marketing plan for the film John Carter, which was directed by his friend Andrew Stanton. When the film flopped due to his perception of sabotage, he threw a huge fit to oust Walt Disney Studios Chairman Rich Ross. He went so far as to threaten to leave the company if Ross was not immediately replaced, and sure enough, shortly after John Carter was released and flopped, Disney announced Ross’ replacement, Alan Horn, an outsider with a wealth of film experience. So what does this mean for the weather man before 2015? Lasseter has apparently also threatened to leave the company if he (Iger) is not replaced before the June 20th, 2013 release of Monsters Inc 2. This is not to be taken lightly, as a shake up of this caliber could have a rippling affect throughout the entire company. If this happens and Iger is removed from power, it is likely he will take either CFO Jay Rasulo, Chairman of Parks & Resorts Tom Staggs, or both with him. Depending on who he takes and who replaces him, others including Meg Crofton could be on the way out too, and there are many in the fan community who would jump for joy if it comes to fruition. I think the best way to describe the resort under current management is what some call “the Rizzo factor.” They’re tooooourists, what do they know? The next time you see empty buildings at Pleasure Island or the missing Lights of Winter, look around at all the people with 1st visit buttons on, completely oblivious to what once was, and you’ll see just how obvious the Rizzo factor really is. We can only hope that with a change at the top, the Rizzo factor will be significantly reduced. I have to of course add that this is a rumor, and a big one at that considering the potential chain reaction it could have within the company and specifically on the parks. However, this comes from a source I consider to be reliable. Stay tuned on this one as well. It certainly will be interesting to see how it all plays out! Lastly, in keeping with the big spirited change indicated by this blog’s title, more and more visible signs are appearing to indicate Disney might have something up its sleeve for WDW. As of today, Walt Disney Imagineering has completed a change in structure and Kathy Magnum, a 30-year veteran of Walt Disney Imagineering and a principle designer of the recently opened Cars Land at DCA has been assigned to Walt Disney World with the title of Executive Producer, Walt Disney World Portfolio. It certainly seems to be an interesting move and in my opinion, gives more credence to the rumor about Cars Land coming to DHS. This will be another development we watch closely! Are you Ready to Conquer the Tower of Terror?